No grand jury indictments related to Sandra Bland's jail time. 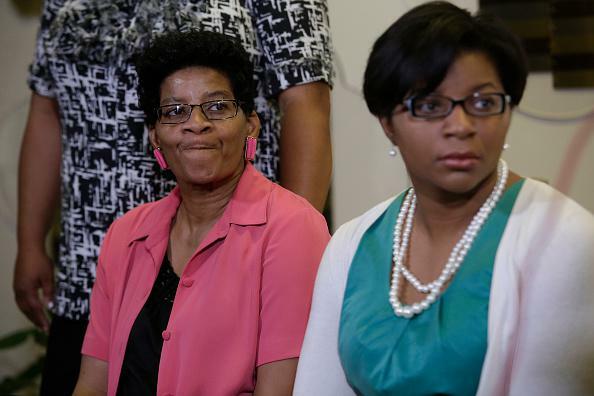 Sandra Bland’s mother and sister in Lisle, Illinois, on July 22, 2015. A grand jury has decided not to issue any indictments to jail staff for negligent behavior in the death of Sandra Bland, the Illinois woman who was arrested in Waller County, Texas after being pulled over for failing to signal a lane change on July 10 and was found dead in her jail cell of an apparent hanging on July 13. The grand jury will meet in January to determine whether to issue any charges against Brian Encinia, the state trooper who dashcam video shows behaving belligerently toward Bland after pulling her over before eventually arresting her for allegedly assaulting him. Encinia has been on administrative duty since the incident, and officials have said his conduct during Bland’s stop violated protocol. Bland, who was in Waller County for a job interview at her alma mater (Prairie View A&M), was still in jail three days after her arrest because she couldn’t raise $500 to post bail. In the AP’s description, she was found “hanging from a cell partition with a plastic garbage bag used as a ligature around her neck.” The jail in which she died is in Hempstead, Texas, some 50 miles northwest of Houston.